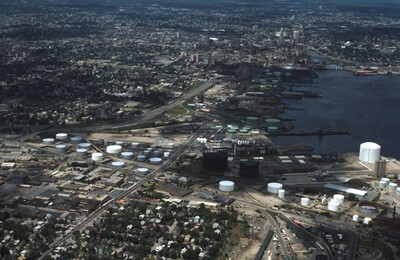 Aerial view showing Providence Port circa 1976. Allens Ave. runs diagnolly across the picture plane, and Interstate 95 enters the frame on the right, curves around the city and continues north to the horizon. To the east (frame right) the Fox Point Hurricane Barrier, just a decade old at the time, is visible, parallel to the Point St Bridge and Interstate 195, which was later relocated in 2008 to just south of the Hurricane Barrier. Smolski, Chet, "Providence Port" (1976). Smolski Images. 252.